Eastern black walnut or American walnut, looks like darker version of walnut and that is where the similarity ends. These smell like forest floor after rain – earthy and spicy with a hint of blue cheese. Wild Black Walnuts are hand-foraged every fall in the Midwest and East-Central United States. Our neighborhood farmer’s market, Sigona’s, carries them in fall. They did not feel right in the breakfast cereal. 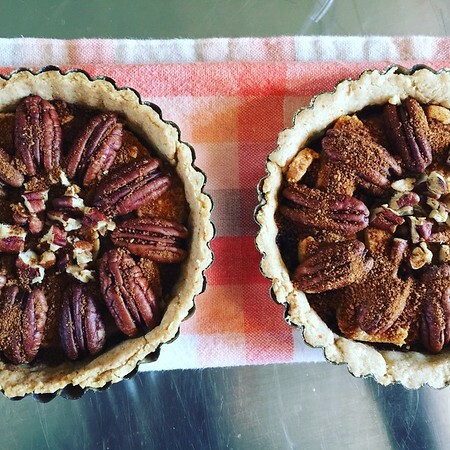 They were intriguing in the pecan/walnut tart. But they blossomed in a walnut pesto. Nowadays, recipes often define pesto as a combination of any herb and any nut. Walnuts, due to their strong flavor, pair well with parsley. Just replace some or all of the regular walnuts with black ones. It will elevate the commonplace “pasta with pesto” dish to a memorable one. And if you particularly wish to pat yourself on the back, combine with a robust wine like zinfandel.